I'm thinking about using Pt-On( with the square looking thing, just use different colors for the different players. I think I want this as a Pic var, not sure yet. It would let it load much faster, that's for sure, then generating the board over and over when menus are brought up..
2) Do we use street names, or calculator programs/famous calc games/shells/etc? 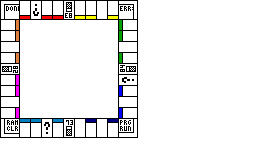 Famous calc programs and each color section can be atributed to a different programmer. Utilities could be Xlib, and Celtic. But they would require icons, which they don't have. I was thinking maybe USB cord and Battery icon.. Might go with that. Doors Icon and TI Icon for the utilities. Little bit of playing around that I did, what do you think? The treasure chest looks kind of crappy.. the low battery icons are to indicate a 'drain' compared to the taxes that were imposed in those two slots in the original game. As well, there are 22 properties, so maybe you can try to assign one major program or app to a color, and then fill the other colors in with associated projects. 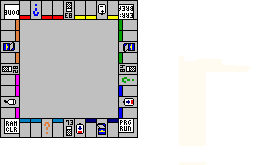 For example, pick two great ION games and ION itself for one color. Interesting ideas. I was wanting to pick authors for the colors, and put maybe their 'greatest programs' or something up there as the name of properties. I'm also thinking about filling in the white space of boxes and center of board with a light grey color, and somehow get 'Calcopoly' going in a diagonal across it, maybe both ways? I'm gonna play with it some, see what it might look like. That looks really spiffy so far, and I love the low battery icon the most, I think (assuming that's what that is). I definitely volunteer to try to make "Calcopoly" (or is that "Calc-opoly"?) 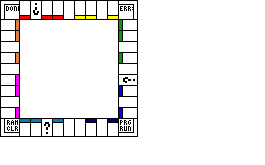 in diagonal text in the middle of the board. What do you think? Been debating on if I should change the color or not. Blue or red might look nice on it..
Definately an excellent idea. Will the property names/icons load from a library? 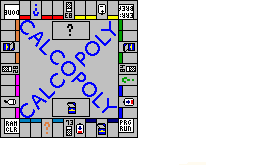 this kind of game has been made. And rules setting/options? Should be simple to implement. As to the rest, not sure yet on how I'll implement things. I know coordinates for where the 'pieces' will display is in a list. I've just not sat down to solidify other aspects, yet. Hopefully, tonight. Oooh, can I have some? Sure, what color and what calc related projects would you like them linked to? [13:46] <+shaun> I want pink. [13:47] <+tifreak_> What calc projects would you like as the 3 properties? [13:47] <+shaun> TokenIDE, Snake, Block Dude. Light blue - FrogRPG, BattleField 83+, and Croquet. There are 285 users online: 10 members and 275 guests. Members: 23lobor, Jeffitus, LogicalJoe, realdonutking123, RogerWilco, Sam, TimmyTurner62, _iPhoenix_. © Copyright 2000-2019 Cemetech & Christopher Mitchell :: Page Execution Time: 0.118526 seconds.